As most internet marketers will know, doing keyword research before building or adding to a website is vital. Without doing keyword research you are likely to generate less traffic because your content will not be focused around a specific ‘keyword phrase’. The first port of call for most marketers is to use Googles external keyword tool or a third party keyword tool such as Keyword Elite or Market Samurai. To be honest, they are all good choices to begin your research BUT if you already have an established website (to some degree) and are wanting to increase the traffic then the first place you should look for keywords is your ‘existing keywords’ within your analytics. It’s easy to search for new keywords and start a campaign to ‘eventually’ rank for those but to increase your traffic, all you need to do is find out which keyword phrases you already rank for’ and work on those to increase their rankings. Here is a screenshot that includes a very small sample of my keyword stats for one of my websites. I have only checked 3 of these to give you a quick example but as you can see some of these keywords are not in the top 3 places of Google YET they are bringing in free organic traffic to my site. This means I have access to potentially hundreds of keywords which DO bring in site visitors and could without doubt bring me MANY more. All I have to do is focus on some of these words and increase their ranking. I would essentially do this by building backlinks using those keywords as anchor text. Also, variations of those keywords. 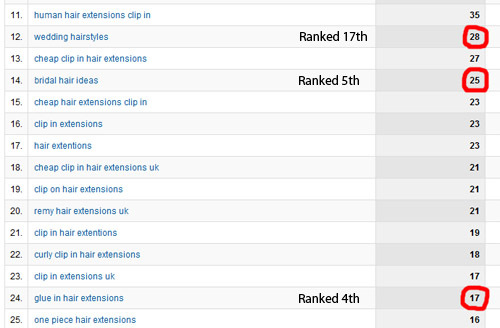 The keyword phrase ‘bridal hair ideas’ brought in 25 visitors in the last month. The current rank for that keyword phrase is 5th place. Now that isn’t necessarily a bad ranking BUT imagine how many more visitors I’d get if I was number 1 for that phrase? or even just number 2? That figure may go from 25 to 35, or maybe even 50! Now imagine replicating this process with a number of these keywords. If my site already brought in 5,000 unique visitors per month, this could easily be taken up to 10,000 – 15,000 over time. All by focusing on the keyword phrases you already rank for rather than finding new phrases. The thing you need to remember is that ALL of the keywords within your analytics / stats are REAL keywords that people have used to find your site. The results and figures you see are not skewed or inaccurate like you see in so many keyword tools. Secondly, if you’re already ranked on the first page of Google for a keyword, it means that your content is already weighted towards that keyword and Google is treating your content as being relevant. It would be far easier to increase the ranking for this particular keyword rather than ranking for a new keyword. So, in a nutshell. You may have all the keywords you need right under your nose. Look there before hunting new keywords down! I too often forget to check my analytics, so this is a good reminder. Thanks for the tips Andy. As usual, you were very helpful. I always get hung up on my bounce rate, and forget about all the other very useful data being tracked by GA. I had not heard of using Google analutics for tracking keywords. Thanks for giving me this great tip. Yes, this is certainly a great technique. Most writers will say to produce more content around those well-searched phrases but you’ve picked up on the fact that if you’re already getting traffic to a page without much off-page SEO then adding more links is a much simpler way to gain the value of extra traffic. It’s something I’ve wanted to do for a long time, but was never sure how to approach it. Got a bunch of long tail keywords in my Analytics and I suppose I’ll get an extra boost if I target those properly. What do you suggest for building backlinks with those additional keywords as anchor text? Article Marketing or something else perhaps? does GA show the ranking for those extra keywords, or do you check that somewhere else? Great post!! Are you saying to use the most popular keywords we get from our analytic tools in our forum post or profiles on different profile pages as our anchor text even if the page we are linking back to doesn’t have that specific long tail keyword on it? Hi, I am a newbie in internet marketing and I want to know the different ways to leverage these keywords. Excellent idea Andy.. as far as the seo side of it goes, it appears to me that changing a few words of text on the page is easier than going out and finding a bunch of backlinks. But ultimately, you need BOTH on-page and links. A good post and also a reminder that analytics is not only about knowing your traffic stats but could also help identify your keywords that bring in traffic. I too use the same process to get Jailguide.com ranked – very simple and its true – many people overlook the power of free apps. I like using keywords I already know convert… and they are shown to be converting! i learned a lot! thanks man! Hi – Thanks Andy – We forget sometimes that some free tools that we have right under our noses – we neglect to use to get more of the traffic that we are already ranking for. A great reminder. I’m off to look at my analytics report. Thanks for the great information. I was thing the other day when I was in Google Analytics that there should be someway for me to use more of this information, but what you suggested never entered my mind. Thanks again, I am going to give this a try. Thanks for giving away a golden tip that I have been using myself for awhile now. Many people just dont realize that google is telling us exactly what they want and what is working for our sites with analytics,webmaster tools, wonder wheel. Thank for that great post. I was reading everybody’s questions and responses and I learned a lot here. We all want to know how to bring more traffic to our sites. It’s always good to learn from someone that has found a successful method of driving traffic and how to implement it because a lot of people would tell you to do this or that and have never done it themselves. This is a method that I can apply immediately. So I am going to get started now. I love you, andy, it is usefull. Pretty interesting idea, I will definitely check it out. Thanks for sharing. Thanks for the tip. I never thought about using GA to get more keywords. Now I will do so. Thanks!! I thought I was deleting my ning account! An excellent tip, will take it on-board, any more? Thanks Andrew, this is a golden tip that can really change my websites placement. I use always Google Analytics, but I never thought about it. Hi Andy, thanks for the tip. I like a lot of the comments have been using Google Analytics for a long time, but never thought to do what you are telling us. I will be looking at this from now on though. “The first port of call for most marketers is to use Googles external keyword tool or a third party keyword tool such as Keyword Elite or Market Samurai.” This has been my normal routine. So thanks Andy for sharing this new idea. Never really thought of it like you described. It is always amazing how many simple things are right under your nose and you do not use them properly. Thanks for this great tip. Good info as usual from you! I didn’t know of Google analytics so far, may b coz I am a beginner, anyways it seems a big ocean each time getting something new out. The post is helpful,thanks for sharing it.